Ever since coming back from Berlin I can’t stop thinking about German cake! Maybe it’s the fault of the World Cup too, since I’m supporting the German team, and in my twisted mind I associate the German Fussball Elf with German cake. Don’t ask me why, but I do. Name Podolski, Klose or Müller to me and I see German crumble pastries, apple cakes and a famous brand of yoghurt in front of me. If I could, I’d eat the whole team! In fact, if they win the World Cup I shall make 11 different German inspired dishes – all in honour of the boys. Oh dear, now I kinda wish they won’t make it. In case you’re wondering, I’m writing this post whilst watching the Germany Spain match. So far, so boring. It’s 0:0. So I hope my cake talk will boost the German performance and distract the Spanish defense. 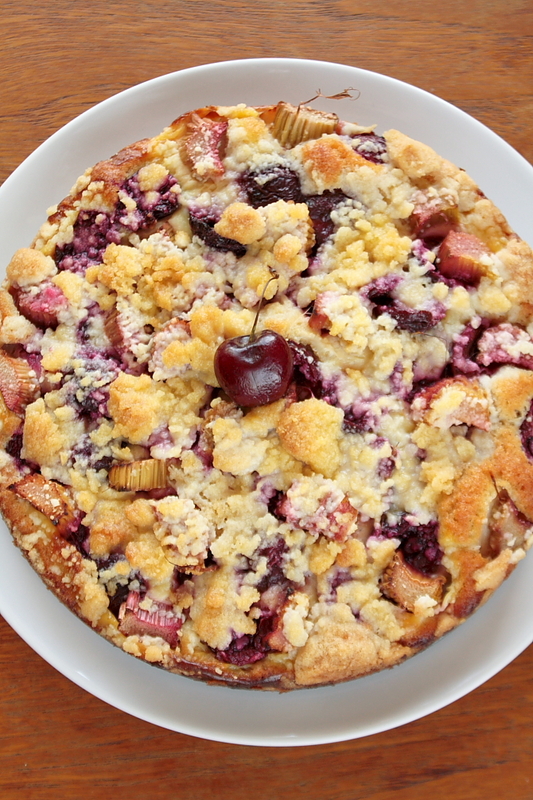 Anyway, over to what this post is really about: a heavenly German Kuchen. 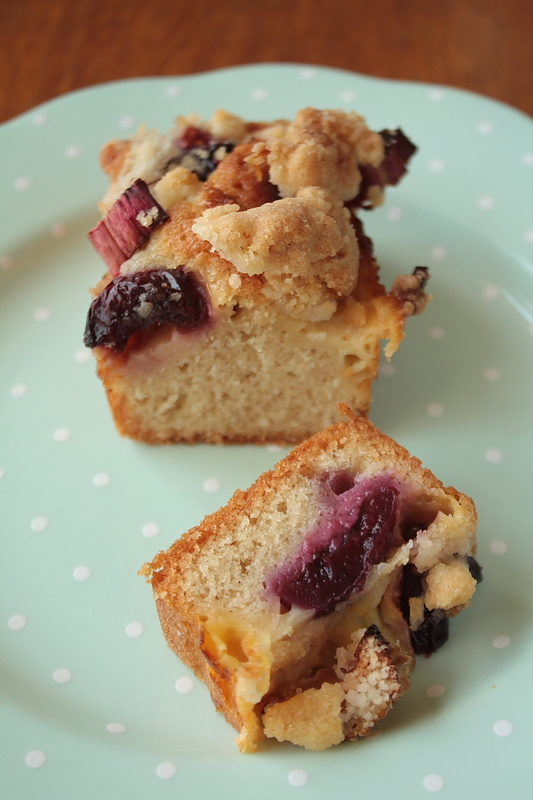 It’s got a nice proper cake base, topped with some creamy vanilla pudding, juicy cherries, tangy rhubarb and buttery crumble. A match made in Fussball heaven – em sorry, Freudian slip – in cake heaven! The cake was inspired by a Dr. Oetker baking book I bought on my Berlin trip. Fabulous book, full of yummy inspiration. One of the cakes in it had a pudding layer underneath the fruit topping, so I thought that sounds well nice. The Germans make some great ready-made pudding powder. I’m normally not the ready-made kinda gal, but believe me, Müller, Mondamin and Dr. Oetker and co pull it off! You just mix hot milk into the powder mix and you get a great pudding. If you can’t get ready-made pudding powder, I’d suggest going for custard powder, but using less milk so it’s not too runny. If you haven’t got custard powder, why not try Mowie’s’ grandma’s pudding. She’s German, so she must make a mean pudding! Plus Mowie told me it’s super easy to make, so I think it’s well worth a try! For this recipe I actually only used one packet of pudding powder, but I’d strongly recommend using two, since most of the pudding had been absorbed by the dough once it was baked. So, unless you don’t like pudding on your cake, go for a double portion of pudding. 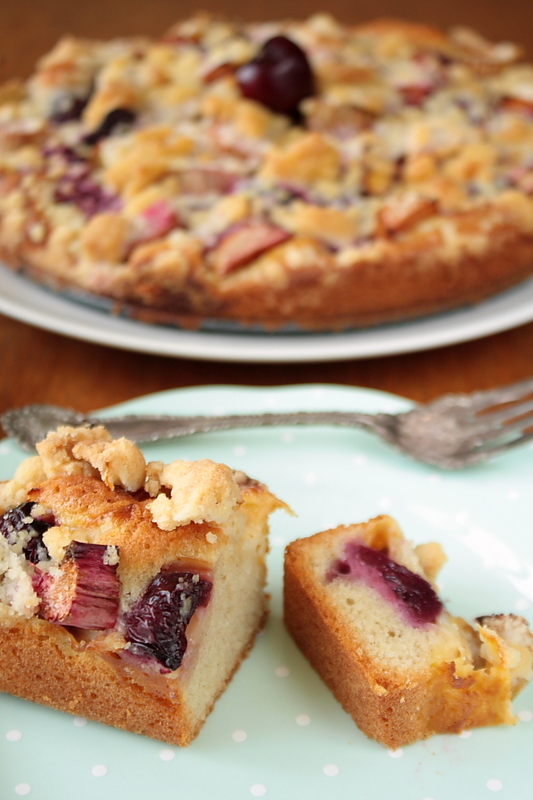 You can use any fruit for this cake. 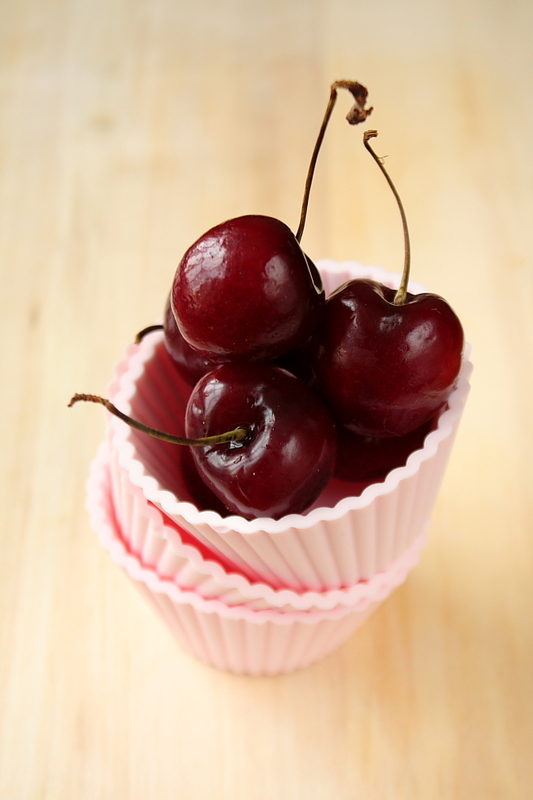 I was planning on making a pure cherry cake, but ended up throwing in some leftover rhubarb – which actually complimented the cherries beautifully. Ahhhh, no, no, NO! Spain just won the half final!!! NOOOO!!! Oh well, instead of a celebratory cake, this is then going to be a ‘things-are-going-to-get-better’ and ‘well-done-boys’ cake. Still, I think that Octopus Oracle deserves a slap up its tentacles! Bloody thing! Let’s hope it predicts a great cake season next! At least then we have something to celebrate! Preheat the oven to 180°. Start by preparing the fruit. Wash the cherries, cut them in half and take out the stones. 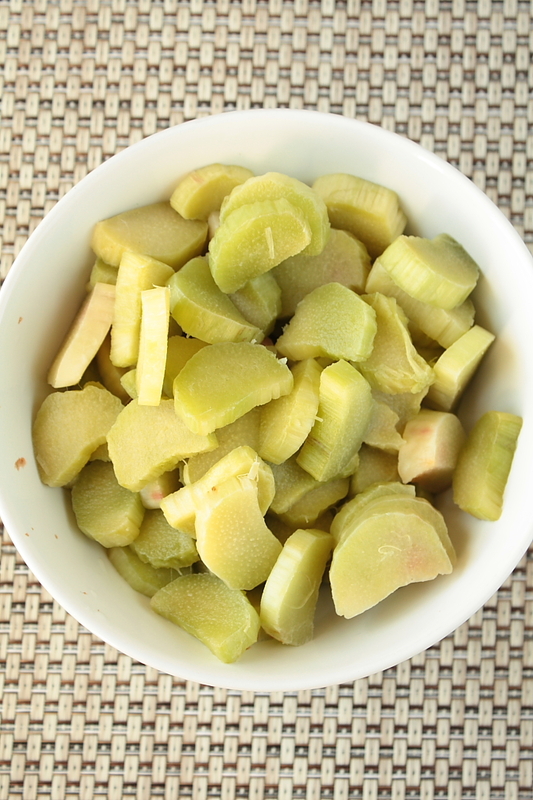 Wash the rhubarb and cut it into chungs, about 1 cm thick. Make the pudding according to packed instructions. Mine just said to heat the milk and stir in the powder whilst stirring. Take off the heat and let it cool down a bit whilst you make the batter for the cake base. In a big bowl, mix the soft butter with the sugar until creamy. Add the eggs one by one, always beating in between of each egg. Mix the almonds, flour, cinnamon and baking powder, and gradually add the mix to the egg mixture. Mix until you get a smooth dough mix. Make the Streusel: Put the flour and sugar into a bowl, add small cubes of cold butter to it. Use your hand mixer to transform the mix into rough crumbles. Feel free to use your hands to rub the mix to get the crumble, but make sure to do so quickly so the crumble doesn’t become warm. Line your cake tins with baking paper (or brush them with melted butter). Divide the cake base between the various baking trays. Add a layer of pudding onto the cake base, then scatter the fruit evenly over the pudding. 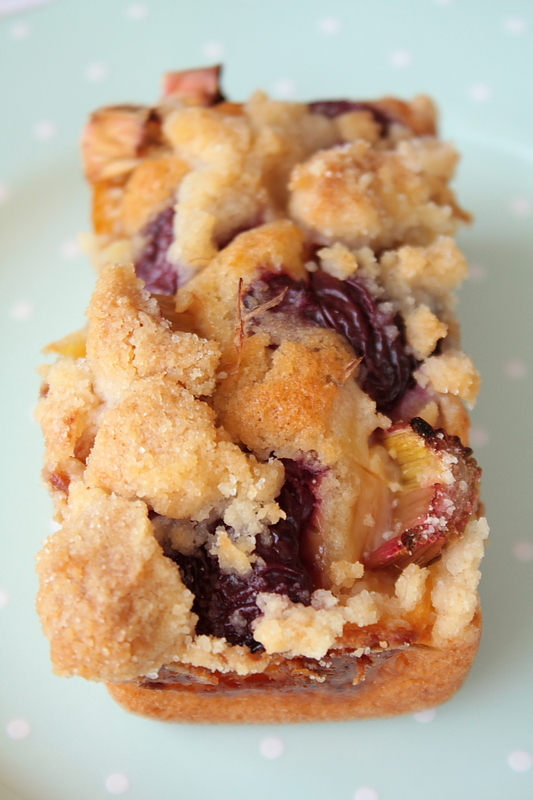 Top with a generous amount of crumble. Bake for about 50 minutes, turning the cakes from time to time so they bake evenly. The cake is done once your crumble is nicely golden and a skewer inserted comes out ‘clean’ (without dough sticking to it). Thank you! Let me know how it goes! Anne, as always beautiful! You make me crave sweet things…which is no mean feat. This creation looks stunning and really simple to make. I can’t wait to try it! You know what? I am actually a savoury person, disguised as a sweet one in this blog. Very strange! Oh my, that looks delicious! 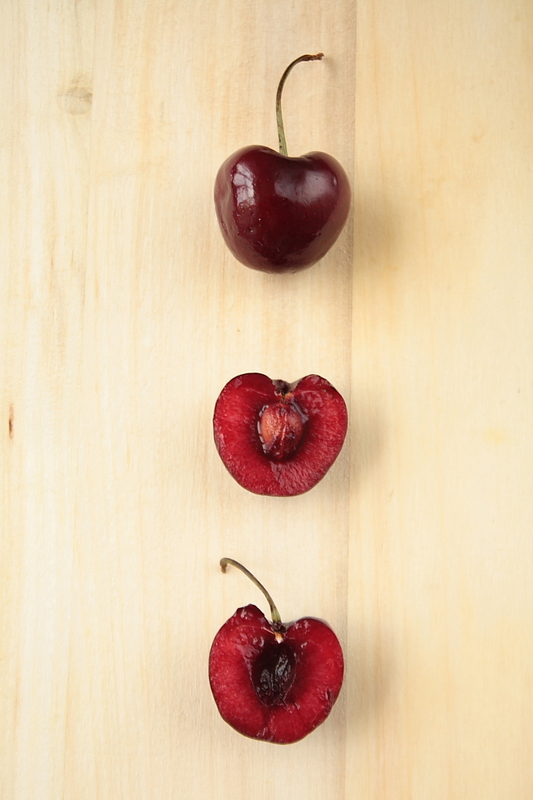 Don’t you just love all these beautiful cherries? I can’t get enough of them. Lovely pictures as always Anne! Oh yes, schade! At least they’ve come 3rd in the World Cup now! 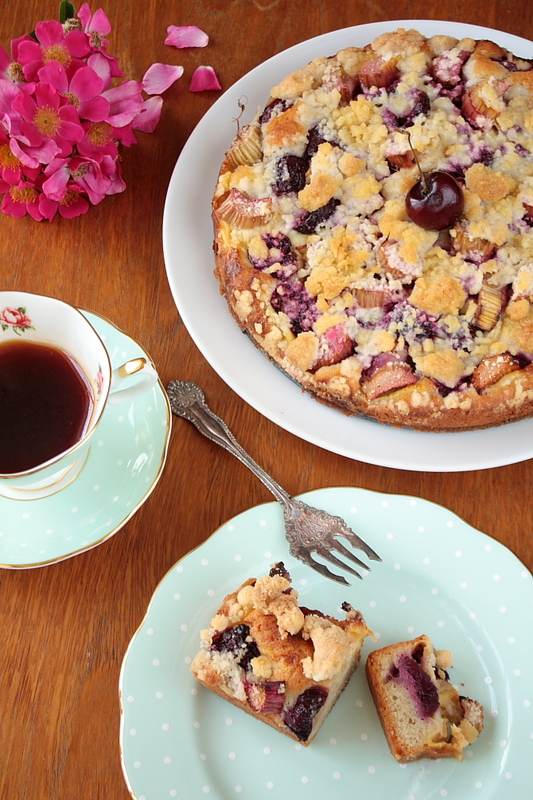 Absolutely gorgeous post – I don’t know whether I’m swooning more for the cake or the crockery! Thanks for the football commentary – that’s about as close as I’ve got to watching a match throughout the whole thing!! Ah the crockery! 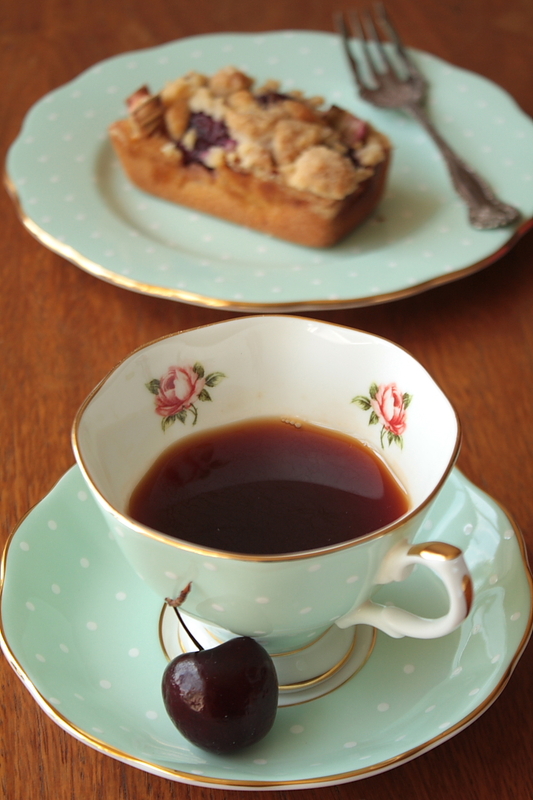 Well for this shoot I borrowed my sister’s birthday present – a set of Royal Albert tea crockery, style 1930s (they currently sell them at John Lewis). The beautiful fork is courtesy of Julia from Always Leave Room for Desert, she mailed it over from Canada! Amazing present! 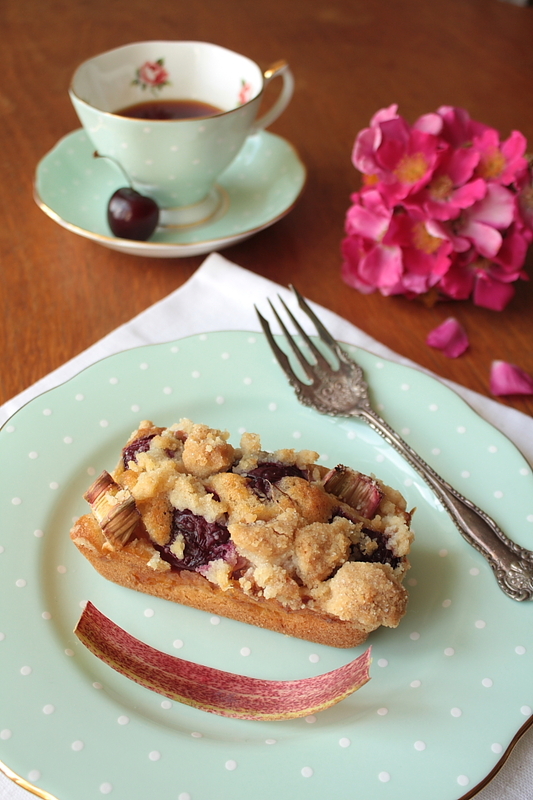 I love cherries, i love rhubarb and i love streieel cake. So this must be some amazing cake. I am in a middle of a move, so my kitchen is a mess but as soon as i am up and running i am making this one. Thank you! Well good luck with the move! It’s a super stressful time, so I hope it’s over soon and you can unpack your new kitchen! Great post, you have pointed out some good details , I as well believe this s a very wonderful website. Love this cake! Though without readily-available Pudding mix in the UK (not even at Aldi! ), I have substituted it with custard powder made up with double the powder for the quantity of milk on the packet. Delicious. Super Nadine, dat freet mech immens! An mega gudd Idee mat den Huewerflacken, dat war bestemmt deck gudd! Mat Quetschen gett et och secher super. Loss der den Kuch weiderhin gudd schmachen!